For your yoga class you may be looking for products that make yoga your exercises more fun and easier. In our assortment we have various yoga accessories from yoga balls to functional yoga chairs, yoga wheels, yoga benches, yoga eye pillows or yoga weight bags. 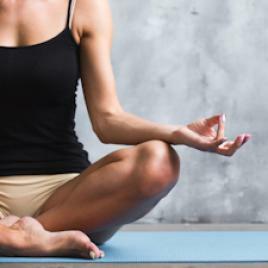 Yoga accessories provide support where needed. In addition to comfortable yoga clothes, yoga products can help to make your yoga practice more relaxing. 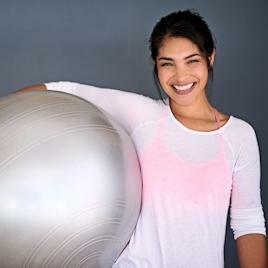 With a yoga ball your body has to use its own strength to prevent the ball from moving or rolling, which means that you not only strengthen your core and perfect your balance, but also strengthen all other muscles in your body, especially in your legs and belly. Bodhi's yoga chair resembles a normal folding chair, but because the back part is missing, this chair is perfect for yoga. A yoga chair can be used as an aid for standing yoga postures that are not easy, or as support for back bends, twists and other postures that are normally too strenuous. 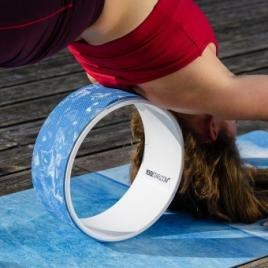 A yoga head stool helps you to perform a comfortable head position. A headstand can be very challenging, especially for a starting yogi. The advantages of using a head stool include protecting the shoulders, relieving the neck, stabilizing the body, relieving tension and improving blood circulation. With a head stool you get the benefits of an inversion without the tension of a normal head position. A yoga eye pillow is a pleasant accessory that helps to relax your eyes and eyebrows, and block light during Savasana. Yoga eye pillows also help you to fully relax during meditation. The yoga massage ball is a very effective self-help tool that can strengthen muscles, open joints, increase flexibility and stimulate blood flow. In our range of yoga balls we have different designs, sizes and firmness to massage specific parts of the body. A yoga wheel is more than just a wheel. This wheel is designed to help with stretching and releasing muscle tension in the back, chest, shoulders, abdomen and hips. The wheel is not only suitable for yoga, but is also suitable for Pilates. With a yoga wheel you release tension. When you roll on the wheel, space is created in the spine and any muscle tension is removed. By using the wheel you get more flexibility. With a yoga wheel you can develop and strengthen your entire body in a safe and efficient way.